Meet The New Analysis: Game Report, Retry Mistakes And More! If you want to improve your chess game, we have big news. Today, we released an entirely new Analysis product: one that will transform your post-game experience into an eye-opening encounter with everything you have to learn from your own games. Not only that, but you'll be exploring those key moments in ways that are visual, interactive, and fun! 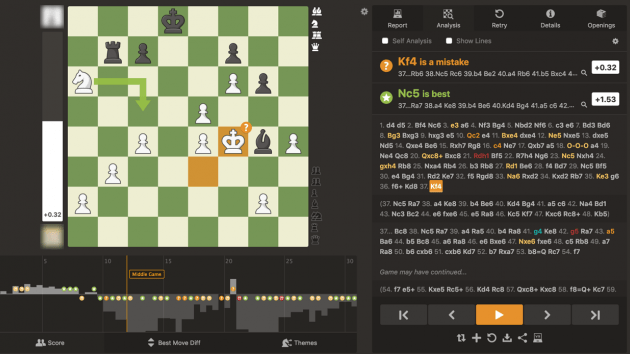 As you may have already seen, the new Analysis experience begins as soon as your game is complete; the chess engine does a very speedy evaluation of the game to assess its general arc, and provide summary commentary, along with a tally of some of your questionable moves. This is the ultimate bird's-eye view of your game analysis. Let's start at stage right, with the sidebar. Halfway down, you'll see the game arc and summary, and a familiar histogram to show who held the advantage as the game progressed. And below that, a list of the game's top themes, many of which include handy links to related learning material elsewhere on the site. Very cool! In addition to arrows and highlights, the chessboard shows the same move-quality icons listed above, so you know the move strength at a glance, with the score shown along the board's left side. And below the board is a collapsible graph...three graphs actually! Score shows a more in-depth view of the game's evaluation histogram, with game phases and move quality made explicit visually. Best Move Diff shows how each move deviated from the best move (if at all). Finally, the Themes graph (shown close up) shows which of the games 'themes are relevant in the current position (brighter text), while the bars show the spans of the game where each one was in effect. Ok, this is where things get hands-on! The computer's advice has never been clearer, as it compares the move played to the very best move. You can opt to do self analysis, turning off the engine's move comparison. On the other hand, if you would like to see deeper engine analysis (with or without the comparison section) then you might want to activate "Show Lines." Ok, seriously...if you take advantage of one new Analysis feature, this might be the winner—especially if you like puzzles! .This feature shows you every Mistake or Blunder you (or your opponent) made during the game, and gives you the chance (as many as you need) to get it right, with full Analysis feedback after each attempt. Even if you find the right move and aren't sure why it's right, the engine can guide you forward, until all is revealed. It's extremely enlightening—and fun! Finally, a note on the strength of the analysis this feature offers, because this is a huge difference between the new Analysis and the old. The "full" analysis that runs on your game to create the report, analysis data, and Retry Mistake positions is extremely fast. It is better than the old analysis you used to wait for, because instead of leaning on client-side/browser-based tech, the new analysis is done by a large cluster of server-side engines. Please dive in to the new Analysis feature, and let us know what you think in the comments below. Or if you find a bug, please report it using the Bug Report feature under Help in the navigation menu. Thank you so much, and happy improving! Have an idea? Want to make a suggestion?